Working in the event and theatre industry, unfortunately, means quite some fabric waste is generated. Apart from the fact that many projects are one-off events, there is a variety of reasons why the confection process produces waste material. Theatres, for example, often require a bespoke velvet colour to match the branding of the venue or the colour of the seats. After creating these custom-dyed drapes, offcut rolls often end up in the warehouse, waiting for that one project that requires that exact same colour of fabric and just the right amount of leftover material. After lying on the shelf for some time, these fabrics are considered lost. ShowTex strives to manage its waste material according to the principles of reduction, re-use and recycling. 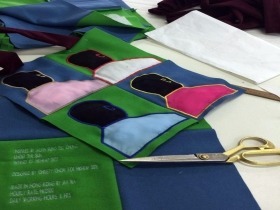 The team in Hong Kong took it one step further and launched its very own ShowTex Upcycling Project! In collaboration with the Centre for Heritage Arts & Textile (CHAT), a part of The Mills project, ShowTex sought and found a creative solution for processing this textile waste. CHAT’s first resident textile artist Alma Quinto, who works with the CARD Hong Kong Foundation, came up with some nice community projects supporting domestic helpers from the Philippines to become more entrepreneurial and master new skills, for improving their lives in Hong Kong and abroad. 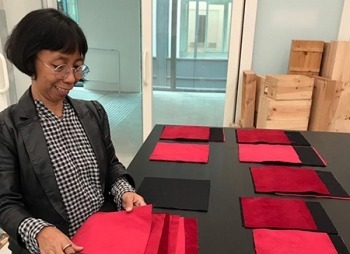 The materials donated by ShowTex were used to create red envelopes for Chinese New Year giveaways, colourful souvenirs and much more items engaging retired factory workers to share their valuable skills with the Hong Kong community. Through this programme, more than 1500 sqm of ShowTex fabrics already found a second life! By offering exhibitions and co-learning programmes, CHAT invites people to experience the legacy of the Hong Kong textile industry and engage in new projects that blend contemporary art, design, science, heritage, community and craftsmanship. As part of this unique network, ShowTex aims for more artist collaborations by inspiring them to work with fabric and find creative recycling solutions in Hong Kong. ShowTex Hong Kong also teamed up with artist Christy Chow, who is a local installation artist and winner of the Hong Kong Human Rights Arts Prize 2017 (HKHRAP). Both with the artist and the HKHRAP, we manufactured an art installation/gift shop with locally produced items made of recycled materials and fabric leftovers. ShowTex did not only donate fabric for this project but also assisted with workshop and labour time! The labels on each of the items reveal the designer and the name of the actual maker, to honour the labour of each individual worker. All items were put up for sale during the HKHRAP ceremony to raise funds for the Justice Centre Hong Kong. As set out in our green policy, ShowTex is dedicated to educating and encouraging its staff to be responsible green citizens and come up with ideas or designs for upcycling projects. Up till now, the results of this journey have been very interesting and promising. We truly hope these initiatives will encourage people to reflect on reusability, upcycling and sustainability topics as there is only one way forward: going green as a team!